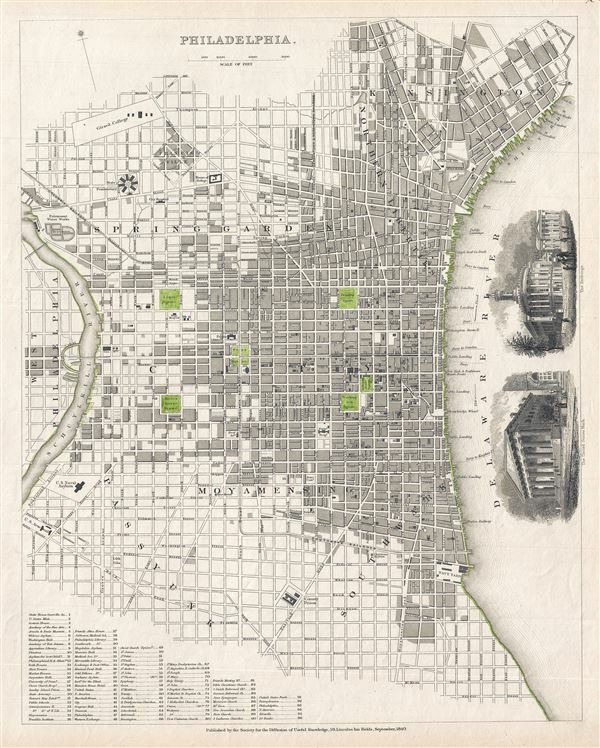 This is a fine 1840 map or plan of the city of Philadelphia by the Society for the Diffusion of Useful Knowledge. It depicts the entire city in stupendous detail, noting individual streets, important buildings, rivers, squares, piers and neighborhoods. A key in the lower left quadrant lists the various locations marked on the map. Two illustrations, one of the United States Bank and another of the Exchange, are included along the right border. This map was published by the Society for the Diffusion of Useful Knowledge in 1840. Although the Society closed its doors in 1848, Subsequent reissues of the S.D.U.K. atlas were printed well into the 1870s by Chapman and Hall, who acquired the original plates.